Tomorrow morning, Crius, perhaps the most significant expansion in EVE Online's history since 2009's Apocrypha, will be released. Crius' wide-sweeping overhaul to nearly every aspect of industry will change just about everything about how things are built in New Eden. If successful, Crius will make industry more accessible to players, and provide a more surmountable learning curve, giving more people an incentive to become industrial entrepreneurs in the game. The user interface has been dramatically improved, and it provides more visual and accessible information about how different aspects of industry work, making it easier to learn and operate. Crius introduces a new user interface for industry, which provides useful information in a more accessible style. Tomorrow morning, as soon as my patch is installed, I will rush to install two small player-owned starbase (POS) towers in a high-sec system. Crius removes standings requirements to anchor POS towers, and opens up new moons in high-sec space that were heretofore unavailable to capsuleers for establishing their industrial operations. I anticipate that it will be quite a "land rush" as pioneering industrialists seek to lay their claim on these new systems. I only hope I can get to my intended moons first. I'm very proud to report that my former corp, EVE University, has done an outstanding job in developing guides for anyone trying to learn the new industrial mechanics. One of my last acts before leaving the Director of Education post at E-UNI was to initiate a project to collate and publish a Crius industry update on the EVE University wiki. Our Teaching Manager at the time, Kivena, took command of this project. He and his team of dedicated teachers and content contributors have put together the definitive compendium about Crius industry methods and practices. I recommend it highly to anyone who wants an orientation to all things industrial in EVE Online. I'm also delighted that Kivena has been appointed to succeed me as Director of Education at E-UNI. He'll do an excellent job, and will carry on the mission of helping EVE Online players to succeed and have more fun in the game. I'm excited about Crius, but I'm very curious about what impact it will have on the economy of New Eden. Will prices go up, or down? Will it be possible for industrialists to operate profitably in high-sec or low-sec, or will all of the profits veer into null-sec space? Can industry continue to be a profitable activity for solo players, or will it become the exclusive domain of large, dedicated industrial groups? My initial estimates and broad calculations tell me that I should be able to make a decent profit making Tech II modules in high-sec after Crius debuts - but we shall see how it actually plays out. There have been a few speculative blog posts about what will happen after Crius. Of the most interesting, mynnna's blog post makes some fairly specific predictions, and is worth a close read. As a member of CSM9, and one of the strongest contributors to the industrial changes, he almost certainly knows more about Crius than anyone else, I suspect. He is also a Goon and a null-sec resident - and as a result, will be one of the beneficiaries of Crius, so bear that in mind as you read his post. But to his credit, and to that of the entire CSM9 team, Crius' buff to null-sec industry is balanced somewhat by expected increases in shipping costs. I anticipate that Crius will not cause a wholesale move of all industrial profits into 0.0 space. I could be wrong, however, and Crius may very well be a complete disaster for industry in Empire space, as some cynical pundits insist. But for now, on the eve of Crius' release, I am cautiously optimistic. So, I go now to set up long skills to train in my characters' queues, just in case. And I'll reprocesses a bunch of loot I've had on hand for ages, since Crius will be less generous in that regard. And I'll get my industrial ships ready to deploy my new POS towers. Finally, I'll await downloading and installing the new patch with great anticipation, and hope for the best. Happy Crius patch day, everyone. Posted in Commentary and tagged with Crius, industry, EVE Online, E-UNI. July 21, 2014 by Neville Smit. 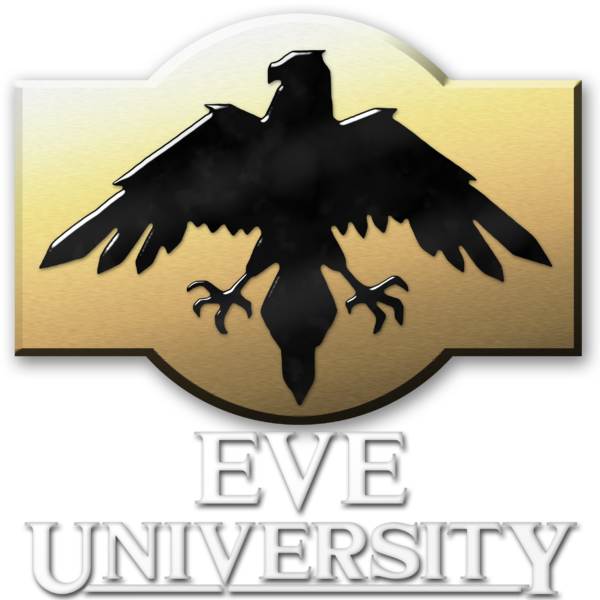 The membership of EVE University fluctuates up and down as the rate of new players trying EVE Online changes. Our mission of helping players to understand and master the game appeals to those looking to overcome the notoriously steep learning curve. Currently, we're on an upswing in applications, because of the publicity generated by the recent massive battle in B-R5RB, and the huge spike in new players joining. We also purge members who go inactive and don't log in for a month, so our membership count represents a real number who are logging in regularly and engaging in corp activities. Currently, that count is rising again and approaching 2,100, making E-UNI a fairly sizable organization (though far smaller than some of the massive null sec entities). E-UNI: our 10th anniversary is March 15th - still going strong after a decade in EVE Online. E-UNI uses a decentralized approach to management, with more directors, managers and staff than most corporations in EVE Online. The reasoning for this is twofold. First, it spreads the work around, lightening the load for everyone. Second, it provides a persistent line of qualified succession as people leave to try other things, in EVE Online or in Real Life. Our corp is a little different from others in EVE Online, as no one is expected to stay in E-UNI permanently. Most join to learn what they need, and then move on to another corp that suits their playstyle. However, as we've relaxed our rules of engagement and expanded the diversity of learning options over the last couple of years, more UNIs are hanging around in our corp for longer periods of time. More are staying with the UNI to try a number of our different campuses (the main one in high sec Aldrat, our Low Sec Campus, Null Sec Campus, Wormhole Campus, Amarr Mining Campus or the Project Solitude team in that remote region), and then settle in with a group that they enjoy most. Those who do stay in E-UNI, however, are expected to give back to the corp - by helping others learn the game, or by assisting with corporation administration. Many become formal or informal mentors and teachers, or join our personnel officers or other staff positions. We have a constant flow of new people progressing through the corp in some way - it makes E-UNI a unique group in EVE Online. I'm often asked, "What's it like to be a director of a large corp?" I'm proud to serve as Teaching Director of E-UNI. I earned this post by working my way up through the corp over several years, and now I am able to contribute to policy setting and planning. The UNI management team is an outstanding group of people - open to ideas, and all dedicated to the value of our mission: help players understand EVE Online better, and have more fun in the game. It's something we all enjoy doing. Like everything in life, however, there are positives and negatives about being a corp director. Visibility: being a director means you really get to know what's going on, all the time. For example, when someone finds a war target's POS in a wormhole, you are part of the planning of its ultimate destruction, before anyone else knows about it. This is a lot of fun - most of the time (see below). Influence: being a director means you get to help shape the direction of the entire group. While E-UNI is more open than most in taking input from the membership, the directors are the ones who shape actual policy. Ultimately, final decisions are made by our beloved CEO, Azmodeus Valar, though his style is more consensus-building than command and control. Resources: being a director means you get access to corporate resources. We can tap our supply of people, ISK and equipment to do things, quickly and effectively. E-UNI is remarkably open about providing access to corporate resources to our directors - I have access to a considerable amount of really cool stuff. This requires a lot of trust, but it also means we can respond quickly to new opportunities, as they present themselves. That flexibility provides real value for our members. Teamwork: being a director means you are part of a team. When I had to diminish my online time for a few months to work on a substantial Real Life work project, I counted on my team to take up the slack in my absence. This they certainly did, keeping our calendar full of classes, lectures and events. It's always great to work with reliable people who will back you up. Notoriety: I freely admit that I enjoy the in-game recognition that comes automatically with being a director in a large corp. It's nice to be known, and I see it in the eager replies I get whenever I say hello in corp chat. It's ego gratifying, to be sure. Visibility: being a director means you really get to know what's going on, all the time - including internal disagreements. 98 percent of our discussions about corporate policy and direction are completely hidden from the general membership, and for good reason. Directors want to be able to exchange ideas and debate freely. Sometimes this produces some very passionate exchanges, which can get a little uncomfortable. It's a necessary part of the governing process, though it's not always enjoyable. Drama: this is the part of being a director that I dislike the most, but it is an inescapable part of the job. Whenever you have more than 2,000 people gathered together in a single endeavor, from a widely diverse set of backgrounds, conflict is inevitable. Sometimes it's because of a simple personality mismatch, or a genuine misunderstanding. Sometimes it is someone escalating a disagreement to an exaggerated level. Every once in a while, it's someone with narcissistic tendencies making trouble solely because they have an erroneously disproportionate understanding of their actual value in the Universe. Fortunately, we have learned how to diffuse most of these situations. In most corps in EVE Online, directors deal with drama by simply kicking the offending party out, with prejudice. In E-UNI, we are more tolerant of dissent - sometimes ridiculously so - and try to ameliorate disagreements through discussion and negotiation. Unfortunately, even this "velvet glove" approach fails sometimes, and we have no choice but to "counsel someone into a more suitable alternative". The more infamous ones get added to our official rogues gallery. Mail: oh, how I hate the e-mail beast, and how poor are my efforts to slay it. It's a never ending battle. After my recent hiatus, I dreaded trying to catch up with the substantial backlog, which I am only now beginning to overcome. And it's not just in-game EVE mail, but forum private messages, my UNI Google mail, Skype messages, and now my blog mail, too. I used to think that winning EVE Online meant having billions of ISK and an unblemished PvP record - now I'm starting to wonder if it is really an empty inbox. The corporate interface: for those who have never seen it, you cannot imagine how unbelievably horriterribad the user interface to corporate functions are in the EVE Online client. It's clear that it was designed for much smaller corps, for example, with little capability for managing large numbers. (I can't imagine how the Goonswarm directors manage - it must be a nightmare.) I've gotten used to most of it, though some parts still completely befuddle me, even after several years of practice. Our former CEO, Kelduum Revaan, was a master of the corporate interface, and as part of CSM7, he provided CCP with pages of necessary fixes and improvement ideas. I hear rumors that devs are now reworking corporate role definitions and management, which would go a long way towards making this functionality behave more intuitively. I want to hear something about this at Fanfest. Hope springs eternal. So, is being a director worth the effort? On the whole, it has been so for me, at least. Yes, there is work and some drudgery involved, as well as frustration from time to time. But overall, the positives far outweigh the negatives. I see it almost every day: people playing EVE Online who tell us that we made a difference. They tell us that they would have given up and left the game, if we had not been there to lend them a hand and show them around. And I see it in the level of participation in our classes, lectures, events and fleets - which is on the upswing. Being a corporate director isn't that glamorous, really - but it is satisfying, certainly. Posted in Commentary and tagged with Eve Online, E-UNI, Directorship, leadership. February 20, 2014 by Neville Smit.